Debs started performing in various guises at the age of 4, but didn’t realise she could sing until she entered a school competition with some friends as a joke. She hasn’t really piped down since. After a few years singing show tunes, including her high point of appearing in London’s West End, she fronted various local bands who wrote their own material. However, it all fell into place when she decided to start singing covers of her favourite songs with The Versions. Debs is known for her powerful vocals, her tambourine solos and her hopeless attempts at on-stage banter. JJ joined the band late 2016 after a chance meeting at the Isle of Lucy jazz blues/blues jazz festival. 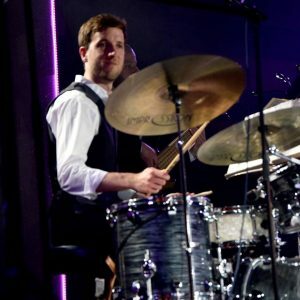 He first picked up the sticks at the age of 8 and is a graduate of both London’s Royal Academy of Music and Birmingham Conservatoire. As an award winning drummer, composer and educator, JJ quite literally trots the globe with his numerous musical exploits when he isn’t Versioning. Any band that has ever managed to ascertain what the initialism JJ actually stands for has never been able to get him to play with them again, so we’ve never asked. Jane has been playing piano ‘since she could reach it’, and has played in bands for the last 10 years, performing gigs all over the UK – her favourite being at the London Astoria. Debbie was a fan ever since seeing Jane’s work in local band Zenith, and securing her involvement was a big part of getting The Versions off the ground. This allowed the band to incorporate far more challenging and complex songs into the set, as well as 3-part vocal harmonies which add a real richness to the band’s sound. Jane can play many songs by ear and has been known to throw an ad-libbed cockney-rock request session into the set if it feels like the right thing to do. Academy of Contemporary Music graduate Chris joined the band in 2012 after a successful audition, for which no-one else turned up. He performs from time to time with a number of local groups, provides guitar tuition and is known for his ability to pull faces in all 12 known keys. He is the also the band’s prog music enthusiast and refuses to listen to any song during which he is unable to grow a full beard from start to finish. Damian cut his musical teeth playing in festive bands to entertain their work colleagues. After developing into a superb bass player, he has supplemented his instrumental talents with a fantastic array of purple trousers and flashy bow ties. He loves Cheese and Guinness, but not in the same glass. Damian can be credited with introducing the band to the Ferryman. © 2019 The Versions. All rights reserved.